Unique 2391-52 Inspection and Testing online practice. One month minimum, cancel any time. 2391-52 Inspection and Testing Multiple Choice Exam Practice use on any online device including iPhone and Android. This product is for exam number 2391-052: the multiple choice test. Designed to help prepare candidates for the Written Paper Questions candidates need to pass when sitting the City & Guilds 2391-52 Practical Exam. 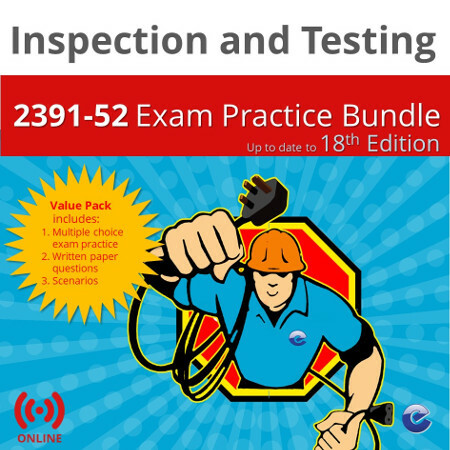 Whether you are taking a 2391 course at a training provider or at college, the Electacourse 2391-52 Inspection and Testing Exam Practice Bundle will give you the confidence you need to pass the City & Guilds 2391-52 Exams. Online 2391-52 Inspection and Testing Exam Practice available from any online device. No minimum subscription period. Unless cancelled by you, we will cancel the subscription after 12 months after which the content will no longer be accessible nor will we be taking any subscription. Use this form for general enquiries. If you are interested in bulk purchase of Electacourse online content. Please use the content licence form. All Electacourse content is available for onsite and bulk purchase. Use the form on this link to tell us your requirements. 18th Edition Online Course is CPD Certified.